If you’ve ever been a student, or strapped for cash, or both, you know Cup Noodles—the instant styrene cup of ramen that goes for around a buck. Cup Noodles appeared on U.S. grocery store shelves in 1972, but parent company Nissin is still peddling its noodles around the rest of the world. To that end, the company just launched a new ad in Brazil and, judging from the contents, it’s aiming for the same demographic that brought the brand success in the U.S. Titled “You never know when you’ll get hungry,” the spot (via Dentsu Brazil) manages to hit on the brand messaging of convenience while also staying hip and relevant to a millennial audience. And how to do that? Drones. 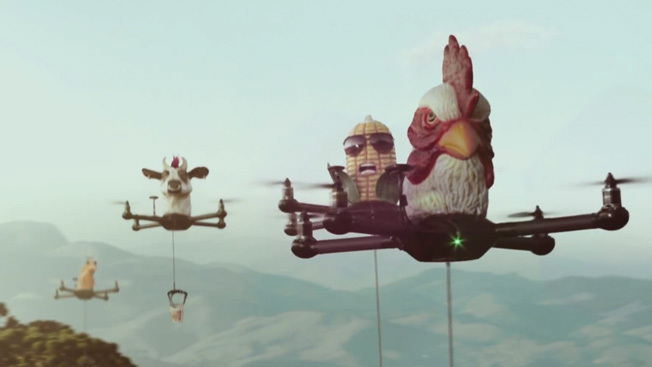 Drones are a controversial topic around the world right now, but the spot’s producers softened the warlike associations by dressing up these drones as cows, chickens, corn and shrimp—which also spotlight the brand’s flavors. Thus outfitted, “the mission of the drones to take the noodles to surfers, skateboarders, and highliners,” according to the press materials. Active youngsters seem surprised and happy to get a soup delivery amid their extreme-activity lives. This isn’t the first time Nissin has taken an off-the-wall approach to its advertising. Past spots used locales like the International Space Station, and starred James Brown.